Goals from Thomas Meunier and Eden Hazard were enough for Belgium to beat England in the 3rd/4th place play off match at the FIFA World Cup 2018 in Saint Petersburg on Saturday. The Red Devils took the lead as early as the 4th minute and never looked like throwing away that lead. England, for whom this has been a highly successful campaign did have a couple of chances in the second half but nothing that could really trouble Thibaut Courtois. The game was put to bed by Belgium captain Eden Hazrad who scored the second goal to ensure that Belgium finish third. 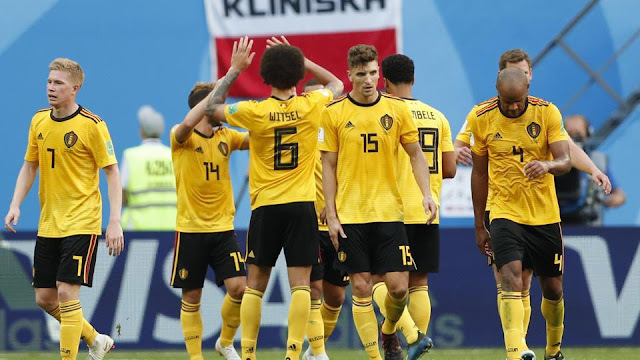 Get highlights of the FIFA World Cup 2018 match between Belgium and England here. 21:22 hrs IST: Full time and Belgium have beaten England 2-0 in Saint Petersburg to finish third at FIFA World Cup 2018. Thanks for joining us. 21:19 hrs IST: Three minutes of added time. 21:15 hrs IST: The game is gone for all intents and purposes for England. All the intensity of the game is gone now. 21:12 hrs IST: GOAL!!!!!! Eden Hazard scores to make it 2-0 to Belgium and kill off England. 21:08 hrs IST: A free flowing move ends up with the ball at Meunier’s feet and his thundreous attempt is well saved by Pickford. 1-0 Belgium. 21:05 hrs IST: Belgium break quickly on the counter attack and Dries Mertens cuts in but his shot is wayward. 21:01 hrs IST: England are in the ascendancy, they are getting chance after chance but just can’t beat the goalkeeper. Maguire, Dier all with good chances. 21:00 hrs IST: Brilliant from Alderweireld after Dier beats Courtois but his Tottenham teammate denies him with a superb clearance off the line. 20:57 hrs IST: Eric Dier lets one rip but it’s straight at Thibaut Courtois. 20:54 hrs IST: Interesting phase of the game with both teams finding themselves with an opportunity to score but the door is closed just before they can shoot. 20:48 hrs IST: An hour gone and Belgium have shown what a great team they are, England though have done very little. Romelu Lukaku goes off and in his place comes Dries Mertens. 20:45 hrs IST: Poor from Lukaku! his first touch is non existent and what should have been a presentable chance ends up in the arms of Pickford. 20:40 hrs IST: A brilliant free kick by Trippier is defended well by Belgium. Jan Vertonghen is the one who puts it behind for a corner. 20:17 hrs IST: Half-time and it’s Belgium who lead 1-0. 20:15 hrs IST: Two minutes of added time. 20:13 hrs IST: Nacer Chadli has gone off, Thomas Vermalen has come on in his place. 20:06 hrs IST: Close! Toby Alderweireld with an audacious attempt but it goes over Pickford’s goal. It all came from a corner. And it looks like Nacer Chadli’s game is over. His left hamstring is gone. 20:03 hrs IST: Very neat from Belgium and they are playing quick one-twos at the edge of the England area and the defenders are having to be on their toes. 20:00 hrs IST: Half an hour gone and Belgium are once again growing into the game. Tielemans takes a shot that is blocked. De Bruyne and Hazard are running the show. 19:56 hrs IST: To be fair, England have improved as the half as wore on! 19:53 hrs IST: Big miss! harry Kane should have scored, a long ball from defence lands at Sterling’s feet who finds England captain but his effort is wide. He should have done better. 19:45 hrs IST: Loftus-Cheek with a header but it is too comfortable for Thibaut Courtois. 19:42 hrs IST: Youri Tielemans has started brilliantly! He finds Lukaku whose pass finds its way to De Bruyne and his effort is kept out by Jordan Pickford’s right hand. 19:39 hrs IST: Belgium have become much the brighter of the two sides, England look very lethargic. 19:30 hrs IST: The match has kicked off. 19:18 hrs IST: The warm ups are over and the teams are ready to come on to the field, time for national anthems soon. 19:04 hrs IST: At the 2014 World Cup, The Netherlands finished third, beating hosts Brazil 3-0. 18:27 hrs IST: Hello and welcome to the live blog of the 3rd/4th play off match between Belgium and England. Both teams will be looking to go out on a high after semifinal disappointment. Harry Kane has six goals so far in the tournament, he will be looking to further tighten his grip on Golden Boot. Kieran Trippier injured his groin in the match against Croatia and won’t be playing, Interesting to see who replaces him or if there is a change of formation.